This week I had the pleasure of sitting down with Dan Vander Griendt, a Calgary based wrestler. He’s auditioned for the WWE several times in addition to having wrestled across Canada, the United States and England. While currently doing some upgrading at Mount Royal University, he plans to major in sports marketing in the fall. Dynamite Dan, as he’s known in the ring, has been wrestling since he was 15. He explained to me that it’s been a part of him for as long as he can remember. As a teenager who lived in Patterson Heights, he’d bike down to the Hart house during the summer with his friends to check out the wrestling ring that the Hart family had set up in their backyard. He’s also trained with the Hart family in their basement “dungeon.” The house has since then been deemed a Calgary landmark having been the stage where famous wrestlers like Bret ‘The Hitman’ Hart trained intensively. 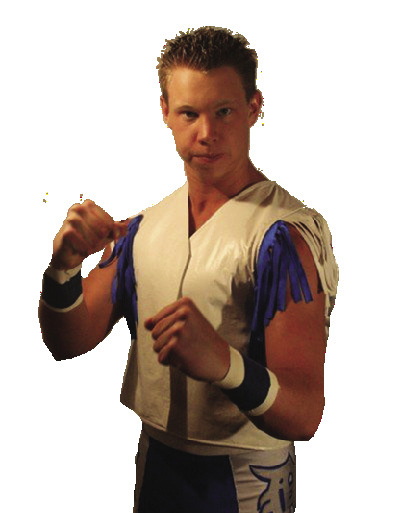 Local Wrestler, Dan Vander Griendt is known in the ring as Dynamite Dan. He is making a comeback this February after having shoulder surgery to repair some wear and tear of the strenuous spectator sport | Photo Courtesy of Dan Vander Griendt. In terms of preparing for a match, Dan does a lot of cardio. He spends time on the treadmill and stairmaster. He also does CrossFit to round out his training. Wrestling hasn’t come without injuries though. He has dislocated his shoulder many times, which has resulted in him having to have surgery. Consequently, he had to take a year off from wrestling. His first fight back was in August – almost 14 months to the day of his last fight. When asked about how long it takes to prepare for a fight, Dan smiled as he said a lot longer post-injury than pre-injury. Before his injury he was wrestling much more consistently, so he never really had time to get out of shape. However now that he’s getting back to it, he admits it takes a lot more work. His favourite part of wrestling is the combination of showmanship and athleticism that’s needed. As he explained it, you need to be an “actor, athlete and rock star” all in one. Getting a reaction from the fans is one of the most important things when it comes to wrestling. He compared it to live action theatre, with fans cheering for their favourite wrestler. The audience is encouraged to be a part of the show. In addition, he shared that wrestling is a great show for fans as they’re the number one priority. Wrestlers want them to come back so they make sure to put on an exciting show. I asked Dan if wrestlers were character based. He explained that back in the 90s when wrestling was really popular that was the case, but now they are more reality based. Even though wrestling might not be as mainstream as it once was, there is still an audience for it. WrestleMania is coming up in April in Texas and they’re hoping to have 100,000 people in attendance. When asked about the biggest misconception most people have about wrestling, Dan answered with “it’s fake.” He explained that there’s actually a lot of skill involved. Because it’s very easy to hurt someone else or yourself when you’re in the ring, you have to be very careful about how you throw someone. It takes just as much prep work and dedication as any other sport. He said that learning the mechanics of wrestling and doing it safely was hard. Dan’s next fight (only his second since coming back from his shoulder surgery) is taking place on Feb. 23 at the Royal Canadian Legion downtown on 7th Ave. Dan will be doing a tag team match with his wrestling partner Pistol Pete. Doors open at 6:30 p.m. and the bell is at 7:00 p.m. It’s $15 in advance or $18 at the door. Tickets can be bought at diyobo.com. It’s an all ages show so you don’t have to be over 18 to attend.